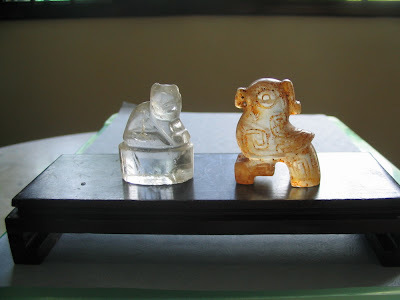 Both are carved from crystal but hail from different periods of Chinese culture. 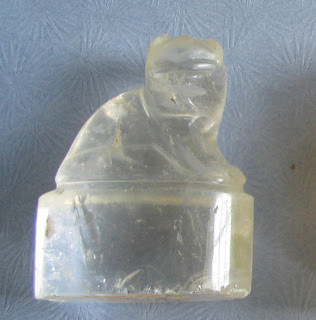 This sleek Puss with the snooty expression is likely to be from the late Qing Dynasty, around 1874-1908AD. It sits on a flat pedestal which must have originally been intended to serve as a seal. However on this piece there is no carving on the flat bottom. I think the "elegant fowl", above is a Parrot. It has a hooked beak, round eyes, curved claws and the tail ends as a stand. The piece is partially corroded by iron rust marks and must have been buried with iron or metal objects. Parts of the body and the tail is covered by an abstract pattern carved in deep, strong (dao gong you li) lines. There are very old concentric ring drill marks in the perforation at the beak. 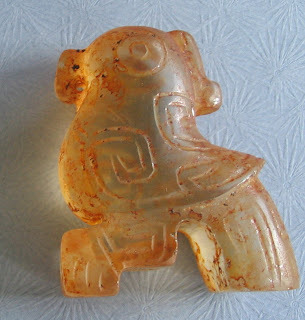 Many parrot pieces have been discovered in Shang excavations and the shape and bearing of this elegant fowl has the flavour of that era. So, methinks or mehopes that this is a late Shang/early Zhou dynasty, about 1200-1000BC piece.